Meatballs? Made of tuna? Oh yes. I did. And they’re delicious! But there’s more! 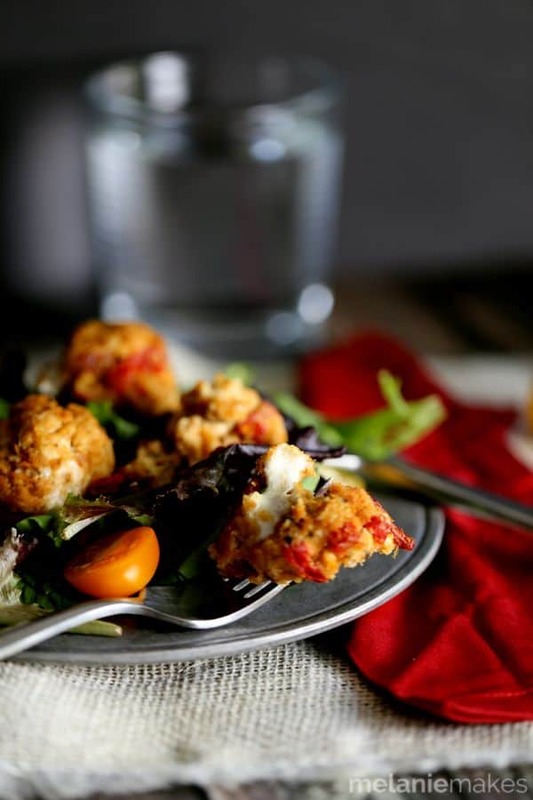 They’re also baked and they contain all the delicious caprese flavors that you crave during the warmer months including julienned sundried tomatoes, diced mozarella cheese and basil. These Baked Caprese Tuna Meatballs are perfect atop a salad, in a sandwich or nestled in a bed of pasta. This is a pat myself on the back kind of moment. I’ve been eating really well the past few months and nearly every lunch I’ve enjoyed has been a salad. As in, I crave vegetables like I never have before. As long as the baby allows me to throw everything together, I’m enjoying a salad at some point during the middle of the day. My favorite mix? Baby spring greens, hard boiled eggs, broccoli slaw, cucumbers and radishes with a homemade balsamic dressing. 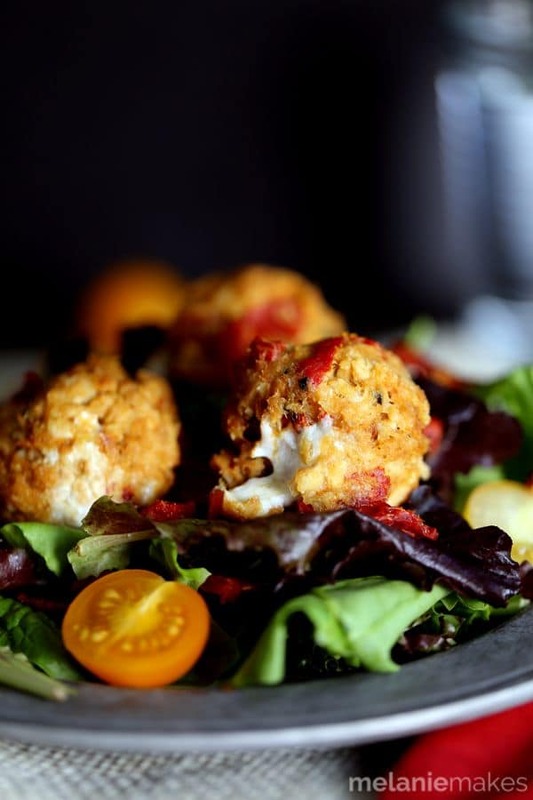 On occasion, the eggs are swapped for chicken breast but now I’ve got a game changer protein to add to the rotation with my Baked Caprese Tuna Meatballs. Meatballs? Made of tuna? Oh yes. I did. And they’re delicious! But there’s more! They’re also baked and they contain all the delicious caprese flavors that you crave during the warmer months. 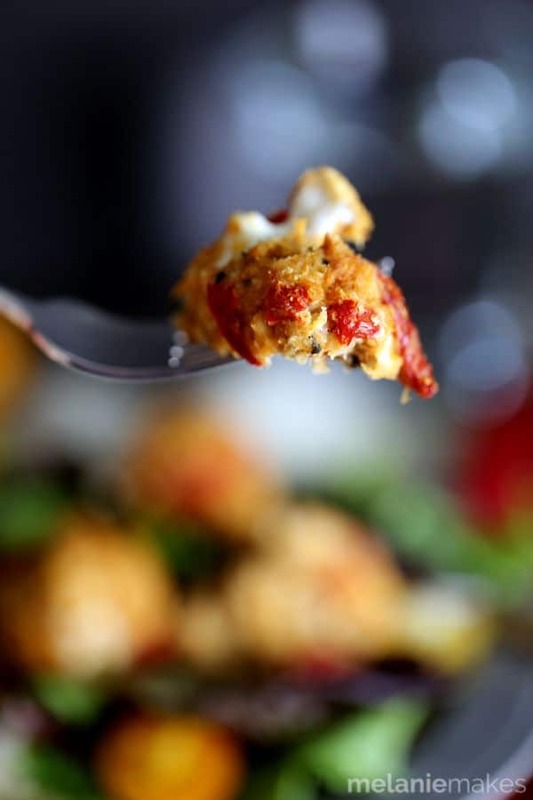 Bumble Bee® Prime Fillet® Albacore Tuna with Sundried Tomatoes & Olive Oil is combined with additonal julienned sundried tomatoes, diced mozarella cheese and basil before being formed into meatballs and baked. These meatballs are not only great on the top of a mountain of salad greens, but I’ve since enjoyed them in sandwiches and with pasta as well. I mean, how can you go wrong when the answer is always meatballs? 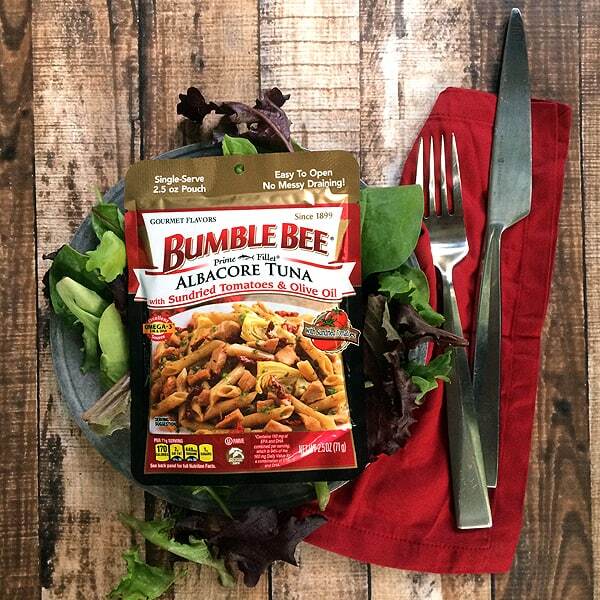 Bumble Bee® Prime Fillet® Gourmet Flavors Albacore Tuna combines the highest quality albacore tuna with the finest, restaurant-inspired ingredients. Convenient and nutritious. Available in 2.5oz pouches or 5oz cans. In a medium bowl, add all ingredients and stir together until combined. Using a medium sized cookie scoop , create nine meatballs and place on a greased baking sheet. Bake for 8-10 minutes or until lightly browned. Serve immediately or at room temperature. These Baked Caprese Tuna Meatballs are amazing straight out of the oven when the diced mozzarella cheese is at it’s ooey, gooey, meltiest. But not to fear! They’re also just as delicious served at room temperature. No matter how you serve them, they make for an awesome protein option for lunch, snack or dinner. They’d even make for a memorable appetizer shared with friends. If you’re into that sort of thing. I'm kind of completely in love with these meatballs! I love tuna but it can always use a little jazzing up, and that's exactly what you've done! Thanks a million, Brandy! You know it's a hit when even my children were fighting to see who got to snag them after I was done taking photos! Thanks, Michelle! Let me know what you think if you give it a try! 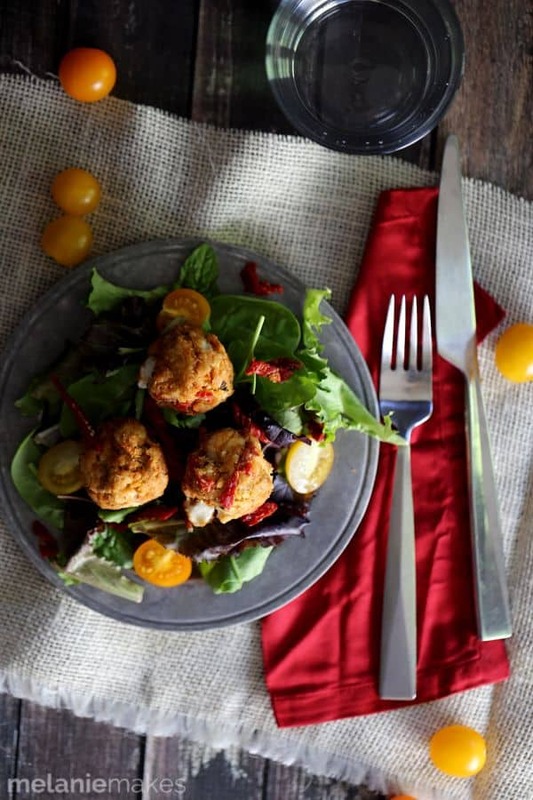 I never would have thought I would crave a tuna meatball but these look fantastic! What a great idea! Thanks so much, Courtney! Who knew a healthy meatball could be a possibility? These look wonderful Melanie, what a creative idea! Thanks, Chris! Hope you're doing well! I've never thought to use tuna in meatballs! My family would LOVE these! Definitely give them a try, Michelle! 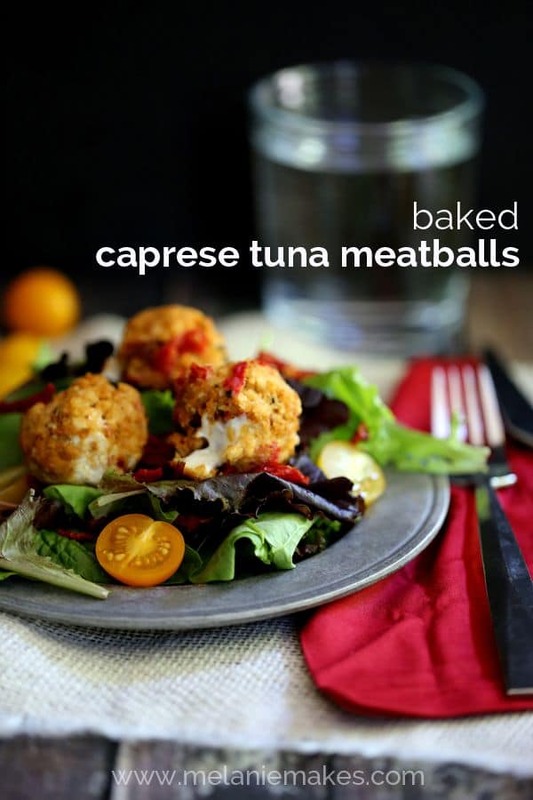 As an Italian descendant I love everything Caprese, these tuna ball are a must have! Thanks for the recipe Melanie! You're so welcome, Loly - let me know if you give them a try! Ahhh, these look soooo good! I have been vegetarian for so long, and tuna was one of the last meat-products I gave up. These meatballs remind me of my mom's tuna burgers in a way. I know I would love these!